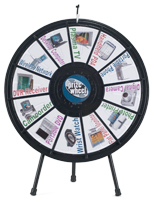 These Promotional Prize Wheels are An Affordable Option for Office Use! These Displays Make it Easy to Market at Trade Shows! Take these Promotional Prize Wheels on the Go with two Travel Bags! 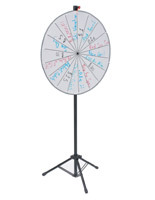 30" Diameter write-on board is customizable with (18) slots. Gloss acrylic surface reflects light and is really eye-catching. Comes with (2) carrying cases for prize wheel and tripod. Acrylic overlay makes writing pop out at viewers. 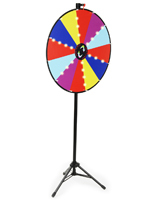 These promotional prize wheels can really liven up any office environment. Use these displays to improve marketing at trade shows. Attract large crowds as this game makes a loud clicking noise when players give it a spin. These multi-color promotional prize wheels are visually appealing. The shiny gloss acrylic finish is noticeable from across a large room, like at an exhibition. 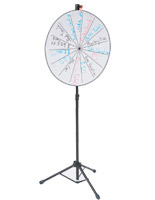 These promotional prize wheels that are dry erase are easy to maintain. With this color filled display, just erase and rewrite giveaways. 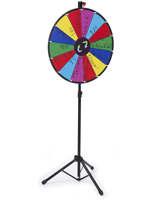 These floor standing promotional prize wheels are 66" tall and easily noticeable. These displays are easy to travel with. 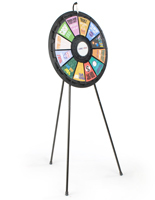 These promotional prize wheels that are acrylic come with two carrying cases for the wheel and for the floor stand. Take this color filled product apart with ease and are ready to travel. 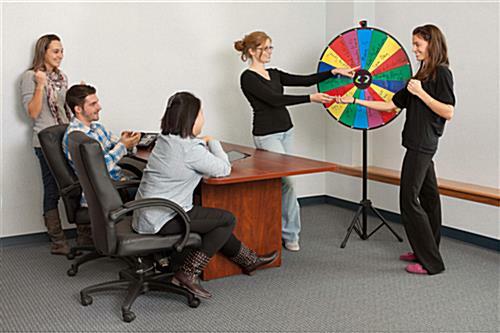 These promotional prize wheels that are for offices can be used to entertain and reward employees. Reward hard work by letting staff members spin to win gifts and giveaways. 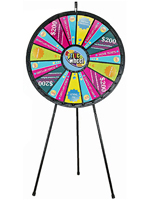 These promotional prize wheels are filled with color and look great with any trade show display. Get more attention for your business or company with these fun displays. 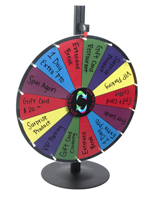 These promotional prize wheels are a must purchase marketing tool for trade shows and exhibitions. 30.0" x 66.0" x 15.0"